Toronto offers something for everybody throughout the year. Summer is the most popular season - schools are on break and many families visit Toronto during the summer. 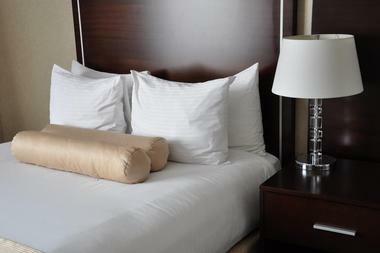 This is the warmest time of the year, but along with the crowds, hotels raise their room rates. Winter is a good time to visit Toronto if you like cold weather and outdoor winter activities. Spring is the best time to visit the city. Between April and May the weather is chilly, but there are no crowds yet and room rates are more reasonable. This is also true for the fall season - September to November the weather and the room rates make this a good time to visit Toronto. January is the peak of Toronto’s long winter season and is also one of the two coldest months of the year. The average high temperature measures in at 32°F (0°C) while the average low temperature is a chilly 23°F (-5°C). As is characteristic of Canadian winters, January, and the rest of winter for that matter, only receives an average of 3 hours of sunshine per day. In February, the temperatures remain the same thus tying with January for the coldest months of the year. March sees temperatures rising to an average high and average low temperature of 39°F (4°C) and 28°F (-2°C) respectively. Toronto Weather in April: The first month of spring arrives in April and brings with it lovely spring showers. As such, April is a generally rainy month with an average precipitation rate of 50 mm. The average high temperature climbs to 48°F (9°C) while the average low temperature makes a huge jump upwards to 41°F (5°C). In May, temperatures take make another steep climb to 63°F (17°C) for an average high and 50°F (10°C) for an average low. May also signals the end of Toronto’s short spring season. June brings with it the summer season and high temperatures of 72°F (22°C). The average low temperature holds steady at 50°F (10°C). In July, Toronto receives the most rainfall annually with about 60 mm of rain falling across the span of 13 days. July also receives the most daylight out of the year, 11 hours per day, and the warmest weather. The average high temperature hits 77°F (25°C) while the average low temperature climbs to 63°F (17°C). August is the end of Toronto’s summer and averages about 10 hours of sunshine daily. The average high temperature decreases by a few degrees to 75°F (24°C). On the other hand, the average low temperature remains the same at 63°F (17°C). Toronto Weather in September: Autumn begins in September with a decrease in average high temperatures and average low temperatures. These temperatures hover at 72°F (22°C) and 55°F (13°C) respectively. In October the average high temperature drops by over 10 degrees to 57°F (14°C) while the average low temperature decreases to 46°F (8°C). A moderate amount of rain can also be expected as precipitation levels reach 40 mm for this month. November marks the beginning of Toronto’s long drawn winter season. The average high temperature drops significantly to 46°F (8°C) along with the average low temperature which sinks to 36°F (2°C). Toronto Weather in December: The driest month of the year is December with rainfall averaging at 20 mm. It is also the third coldest month of the year with the average high and average low temperatures measuring in at 34°F (1°C) and 27°F (-3°C) respectively. For the best deals and less tourists to contend with, one of the best times to visit Toronto is between April and May. If you’re after the most popular festivals in Toronto’s repertoire of events, the best time to head to Toronto is in June. Most festivals kick off in June, coinciding with the start of the summer season. Those who want to participate in Toronto’s International Film Festival should come in September while art fairs are plentiful in October. Ready for winter activities and sports? Come during the start of Toronto’s winter - November. There are several ways to get to Toronto. If you fly you will have your choice of two airports. 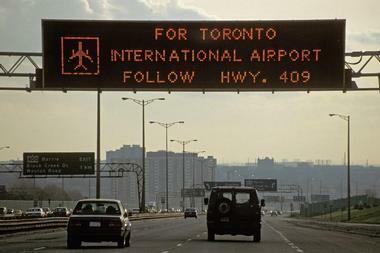 The Toronto Pearson International Airport is the busiest airport in Canada: it is the hub for Air Canada. The other airport is the Billy Bishop Airport located on Toronto Island, just minutes from downtown. It is served by Air Canada and Porter Airlines. For train lovers, Amtrak provides its Maple Leaf service from New York City’s Penn Station to Toronto via Albany, Buffalo, and Niagara Falls. Driving a car involves crossing the border between the United States and Canada. There are many routes between the two countries. Greyhound and Coach Canada are two bus companies that serve Toronto. Toronto is the largest city in Canada: it has two airports, The Toronto Pearson International Airport and the Billy Bishop Airport. At the first airport you’ll find many car rental agencies, some on-site and some off-site. The UP Express links the airport with Downtown Toronto: trains leave every 15 minutes and the trip takes 25 minutes. There are also public buses, taxis, and limousines. At the Billy Bishop Airport there are car rental agencies, taxis, shuttle buses free ferry rides, and several forms of public transportation. What makes this airport unique is that you can walk from the airport to the city in six minutes via a pedestrian tunnel! The Union Station Tourist Information Centre is Toronto’s main visitor information center. 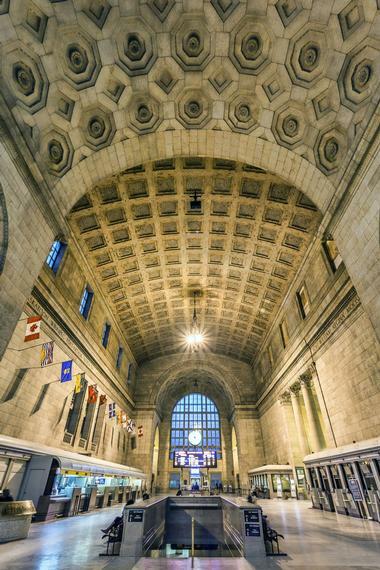 It is located at Union Station, the main train station in Toronto, and it is open all year long. At this visitor information center professionally trained staff will answer your questions such as where to stay, where to shop, what to see, where to eat, and how to get around the city. They will help you plan your trip and put together an itinerary. The staff can also recommend tours. At the center there are many brochures, maps, and visitor guides. INFOTOGO Mobile Visitor Information Centres stop at attractions and events around the city: you can get help from the staff in these mobile information centers. Toronto is huge and there are many ways to get around the city. 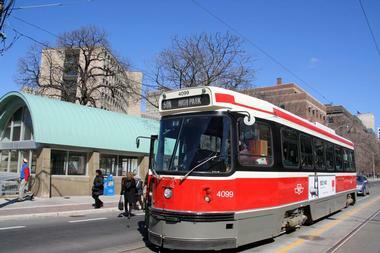 The Toronto Transit Commission (TTC) operates three forms of transportation: the subway, buses, and streetcars. There are single fares and also one day and one week passes. The subway is one of the best ways to get around Toronto. There are two main lines: the Yellow Line runs north to south; and the Green Line runs east to west. The subway probably won’t get you everywhere you want to go: this is when you jump on a bus or a streetcar. Buses and streetcars run 24 hours a day. 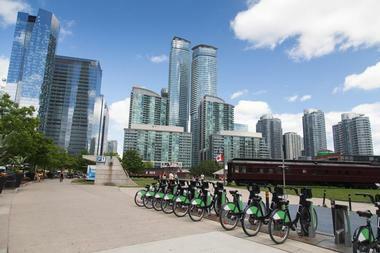 In addition to public transportation there are several other ways to get around Toronto. One popular way is by bike. Bike Share Toronto is a popular public bike system that is available all year. You can pick up and drop off bikes at any location. Taxis can be found in the city, but this is a very expensive way to get around. Driving a car in Toronto can be challenging for visitors. There are frequent traffic jams especially during morning and afternoon rush hours: parking is expensive as are parking tickets. Walking is a good way to get around individual neighborhoods, but not to explore the whole city. 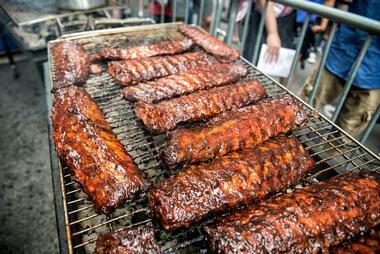 Toronto has a population of approximately 2.6 million people, so it will come as no surprise to visitors that dining choices in this huge city are almost endless. Toronto is a very multi-cultural city so there are many restaurants that serve ethnic food from all over the world. In the Downtown West area of the city visitors will find the highest concentration of restaurants. Little Italy is known for its bars and cafes: it runs along College Street. Chinatown is full of great Chinese food: this area radiates from Spadina Avenue. For Greek food head for the area known as The Danforth/The East End. Uptown has restaurants but not as many as downtown. Toronto is a popular destination for shopaholics: here they can find unique items in vintage shops, luxury designer stores, and large department stores such as Saks Fifth Avenue. There are many shops on Yonge Street that sell antiques, souvenirs, and books. Kensington Market is the place to shop for vintage clothing. For top luxury shops like Chanel and Gucci, head for Mink Mile along Bloor Street West. Yorkville is an area with many one-of-a-kind boutiques. Locally designed trendy items like clothing can be found in the Downtown West area of Toronto. 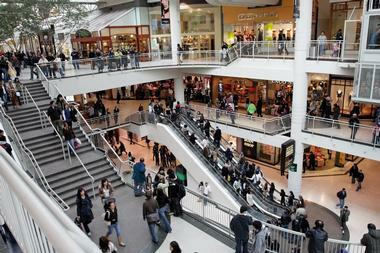 There are more than 200 chain stores at the Eaton Centre, Toronto’s most famous shopping center. As a large city, Toronto is made up of many diverse neighborhoods, each with its own distinctive atmosphere. In Downtown West, there are three islands collectively known at The Toronto Islands: here there are residents but no cars. Harbourfront is the area that was once the home of docks and railroad yards: now it is the home of Toronto’s artistic, cultural, and literary venues. The Entertainment District is also known as the Theatre District: this area is full of well-known theaters and the Four Seasons Centre for the Performing Arts. Chinatown is full of great little restaurants as well as posh shopping centers. Kensington Market is known for its ethnic diversity, food, and vintage clothing shops. With its great variety of wedding venues, Toronto is a popular place for weddings. Canadians and non-Canadians can get married in Toronto. A marriage license can be obtained at any of the Registry Services Offices in the city. Some of the hotel wedding venues include the InterContinental Toronto Centre Hotel, the Toronto Marriott Bloor Yorkville Hotel, Hotel Le Germain Maple Leaf Square, and more. 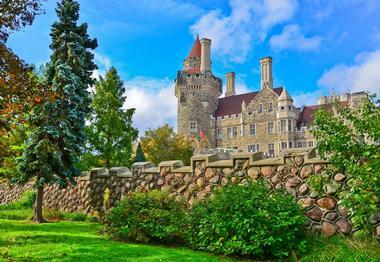 The Casa Loma and Graydon Hall Manor are two mansions that serve as wedding venues. There are several museums and art galleries that host wedding events: these include Art Gallery of Ontario, the Gardiner Museum, and several more. 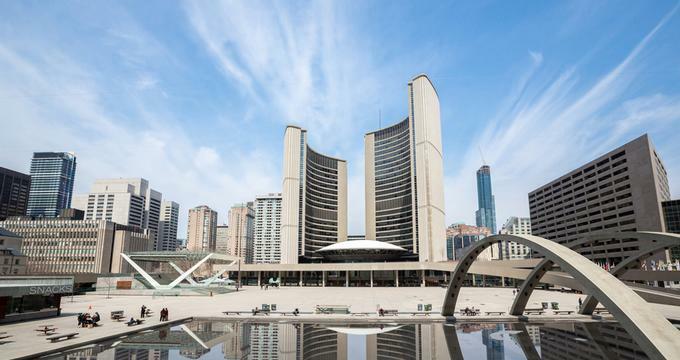 Toronto has nearly 40,000 room from which to choose, from luxury hotels, to bed and breakfasts and inns, to budget and family-friendly hotels. Luxury hotel properties include the Four Seasons Hotel Toronto, the Ritz-Carlton Toronto, the Shangri-La Hotel Toronto, the Hazelton Hotel, and more. Since most of the attractions are downtown, most of the hotels are downtown. Although it is the largest city in Canada, staying in Toronto is not as expensive as staying in other major cities. 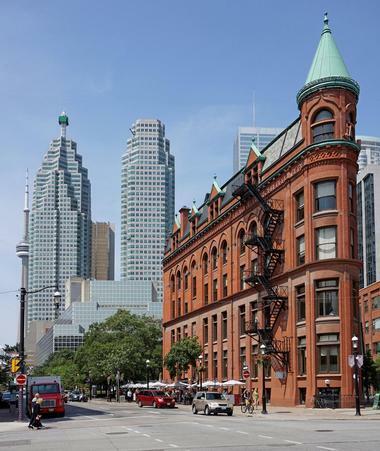 Some of the reasonably priced hotels in the downtown area include Cambridge Suites Hotel, the Cosmopolitan Hotel, Eaton Chelsea, the Holiday Inn Express Toronto Downtown, and many more.